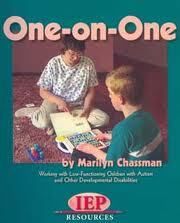 One-on-One: Working with Low-Functioning Children with Autism and Other Developmental Disabilities by Marilyn Chassman. This book provides over 30 step-by-step structured learning activities for students who are non-compliant and have minimal skill repertories. The focus is on reducing aggression, developing communication skills and learning to trace letters by breaking down a task to its basic components and linking them together one step at a time to form a complete activity. Pp. 117.